So long ago I blogged/ranted about how the Group Policy setting “Do not show the Start Menu when the user logs in” was explicitly disabled in Windows 8 (see The must NOT have Windows 8 Start Menu Group Policy Setting). But I have since found a way that you can actually implement this feature (all be it not perfectly) using a simple PowerShell start up script. This script in essence just types the work “Desktop + ENTER” when the user logs on to their session thus taking them to the desktop (see video below). Admittedly the user still load the Start Menu and the few seconds delay is a little annoying however it does technically boot to the desktop without any interaction with the user after they enter their logon credentials. 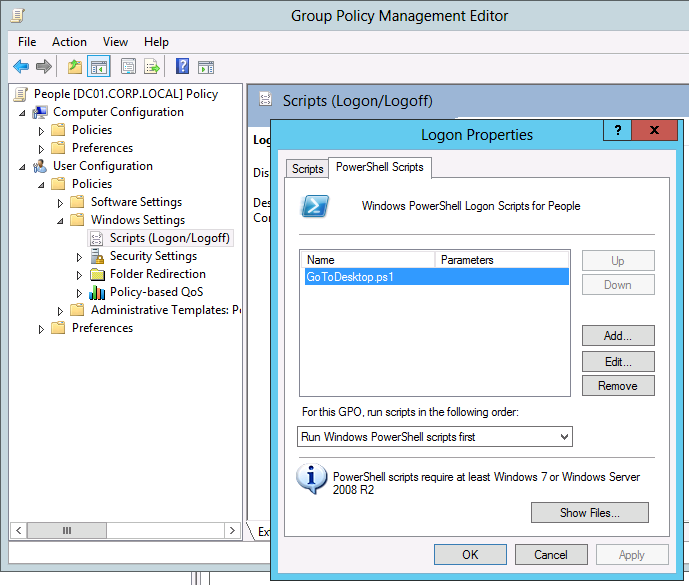 Modify a policy that targets the users that you want to to apply. 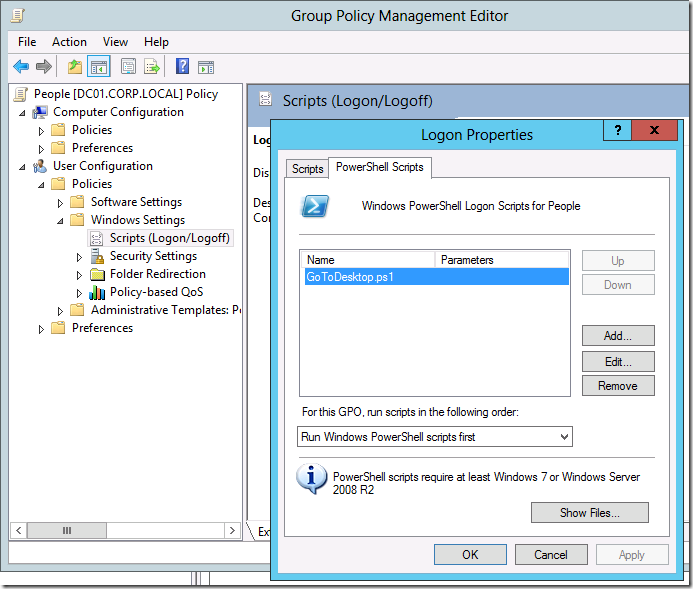 Navigate to User Configuration > Policies > Windows Settings > Scripts then double click on “Logon” and then select the “PowerShell Scripts” tab. Click the “Show Files…” button and copy the PowerShell script into the folder and then go back and click the “Add…” button and enter the name of the script e.g. GoToDesktop.ps1 . Troy Vo liked this on Facebook. Saeed Km-i liked this on Facebook. Emilio Mansur liked this on Facebook. Harshal Sahastrabudhe liked this on Facebook. Funny that there are so many (including me) who really want to boot to Deskop. I hope WIndows 8.1 include such a GPO setting by default and without the delay. 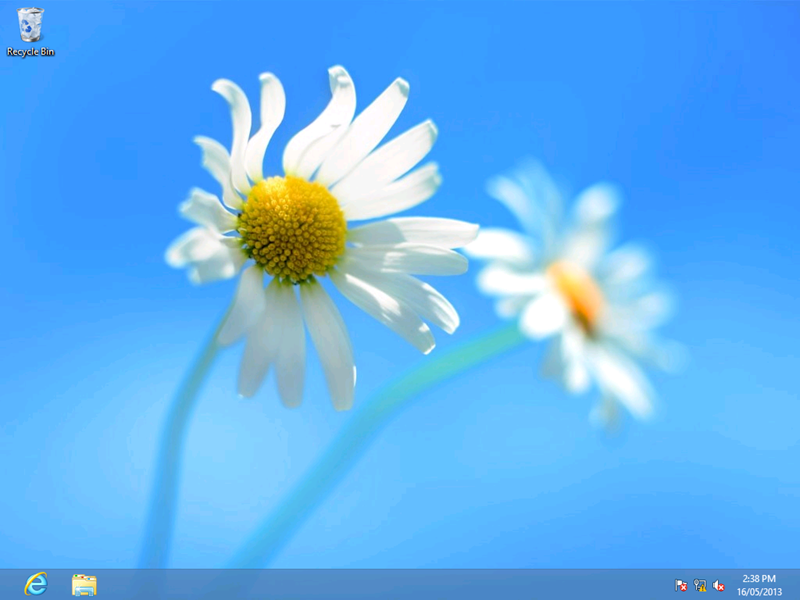 And maybe a GPO for admins to be able to Pin certain apps to the taskbar for the user without using a script. If rumors are to be believed, 8.1 will provide a boot-to-desktop option…. Srinivas Piratla liked this on Facebook. Paul Allen liked this on Facebook.